Star Wars Rebels has never shied away from emotion—and the latest episode, Legacy of Mandalore, offers up an extra-large serving. It puts us smack in the middle of a rare Star Wars conflict, a mother versus daughter, then hits us with a very big shake-up. If you haven’t seen the episode, here’s your spoiler warning. So Sabine, Kanan and Erza head to Sabine’s home planet of Mandalore to ask them to side with the Rebellion against the Empire. However, it’s not a nice welcome because the Mandalorians consider Sabine a traitor, her having defected from the Empire and all. We’ll skip the whole recap of the episode but, basically, Sabine’s mother betrays her, realizes she’s been betrayed right back, and then finally comes to her senses once Sabine defeats the evil Gar Saxon in a kickass, one-on-one, lightsaber vs. Darksaber duel (Seen in that awesome GIF above). Anytime Rebels uses an extended bit of John Williams music, like they did in that scene, you know it’s good. And it was. But of course, finally seeing Sabine reach her full potential and handily defeat the Emperor’s man on Mandalore was a short-lived victory. 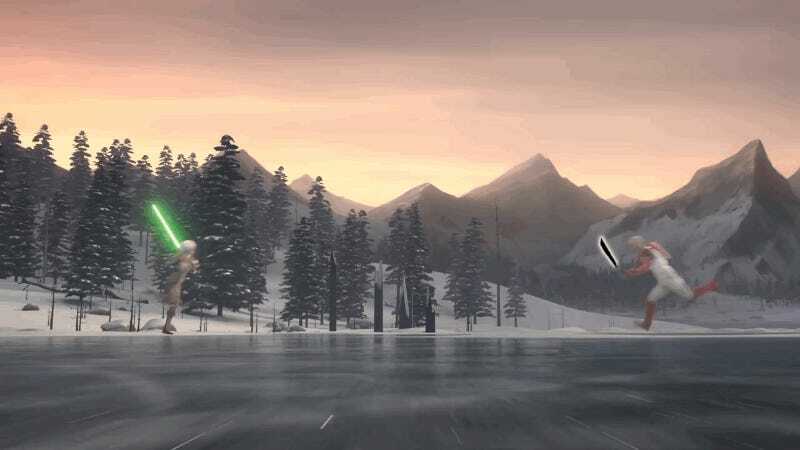 She quickly decided that her life would be best spent not with the Rebels, but with her family on Mandalore. Yes, Sabine has left her trusty family of Rebels. While fans will surely be sad to see her go (at least for a bit), from a strict character basis, this fits. The Mandalorians are a people who prioritize family and loyalty. So when Sabine realized there was potential for their beliefs to align with hers, the same thing that forced her to leave in the first place, staying was the right thing to do. She can fight the same fight against the Empire but now with her real family, not the one on the Ghost. That’s why Kanan and Ezra don’t put up a fight with the decision. She’s still on their side, just not by their side. Though I doubt that’s a permanent thing. If it is, though, it could begin to signal what some fans have started to assume themselves. Rebels may be slowly gearing up for its end game. With Sabine now off on her own, and Darth Maul and Ben Kenobi on the horizon—as well as the battle of Scarif at some point—we don’t know how much time we have left with these characters. What we can safely assume, though, is Sabine will find a true leader for Mandalore and help the Rebels in all of their upcoming struggles. She’ll be back.